Oh, the solitude. This fantastic design has a main level master suite with all the works and a kitchen and breakfast room fit for a large family. Three additional bedrooms can be found on the upper level in addition to a large bonus room and a home theater/game room – for the ultimate in entertaining. 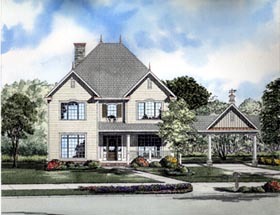 A porte cochere leads to a rear load garage and a basement foundation is available.